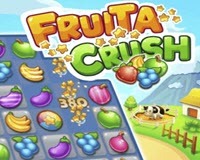 Fruita Crush is a fruitful html5 match 3 game where you have to combine lots of tasty fruits. Jump in fantastic worlds and master over 100 challenging levels. Connect 3 fruits or more, collect as many points as possible and activate all bonus fruits to beat the highest score. Can you master all levels? Use mouse to play this html5 match 3 games.